Until I was nine, I lived in Wheeling, West Virginia, as the youngest member of a household of seven – the others being my maternal grandparents, one aunt, one uncle, and my parents. As one might think, this arrangement involved some financial support, but not in the usual direction. My father made a good living in a contracting firm, Engstrom and Wynn, which built commercial and industrial facilities and public buildings such as schools and post offices. My grandfather owned the house, but his health had failed and he had to quit work at a time when there was no Social Security and no Medicare. 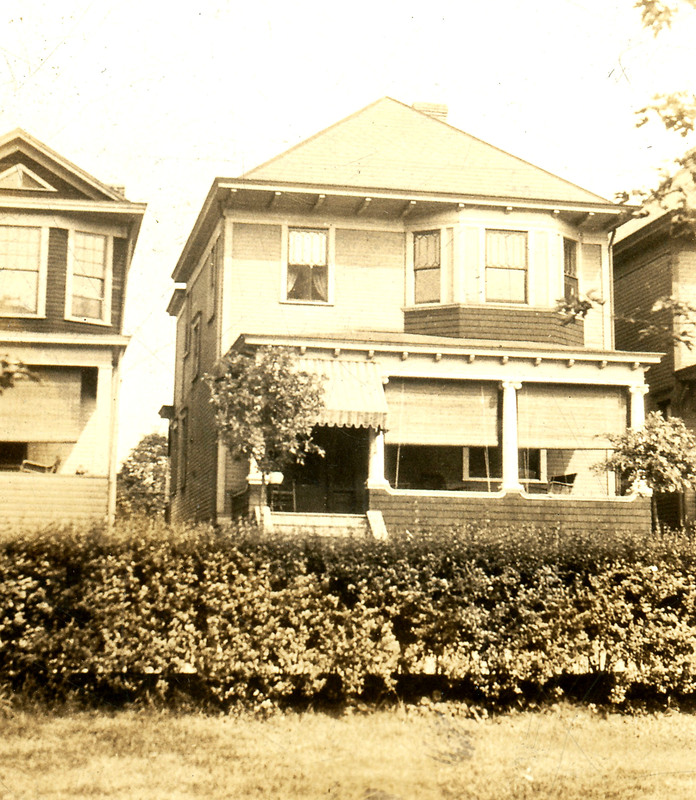 The following photo shows our house at 608 North Huron Street on Wheeling Island. It was built about 1916 and purchased by my grandfather about 1921. The two small pin oaks, planted by my uncle soon after the purchase, had reached about seven inches dbh (diameter at breast height) in my early childhood. In 2011, they had reached between two and three feet dbh. The shades across the porch were later replaced by awnings of the kind shown above the steps, creating a beautiful, softly illuminated sitting area for summer evenings. At that time Wheeling Island was a pleasant suburb of about 10,000 people, in the middle of the Ohio River and just a short walk or streetcar ride across the bridge from downtown Wheeling. At the south end of the island, “the fairgrounds” were a site often used by circuses and carnivals. The fairgrounds came to include a track for horse races, later converted to dog racing, and also a football stadium. Much later, the Casino was built there. On the western shore near the middle of the island, Bridge Park included a baseball field and a public swimming pool. At the north end of the island, which we called “the Point,” there was a wilderness of low-lying land that got flooded every year. I had many wonderful experiences as a jungle explorer at the Point. I occasionally swam there in the “back river” on the western side, long after swimming had been prohibited in the fast-moving main river, where gravel dredging had set up treacherous eddies. Our house was less than 150 feet north of the streetcar stop on Georgia Street. 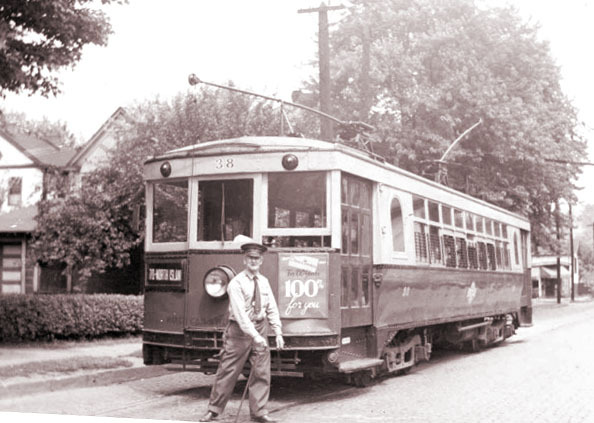 The conductor is shown throwing the switch to direct the car, “Route 70–North Island,” southward onto North Huron Street and back to downtown Wheeling. The fare was five cents. The other switch position sent cars of “Route 71– Martins Ferry” straight across the Aetnaville Bridge into Ohio, then northward to Martins Ferry. The fare for points in Ohio was ten cents. This car stop* made our house very convenient for the commuter into downtown Wheeling. I also found it useful as a place to have pennies flattened on the track. Streetcars were a comfortable and inexpensive means of travel in the city and also for surprisingly great distances into the countryside. In daytime, one car usually passed this point in each direction every fifteen minutes. The cars themselves were non-polluting, although the same cannot be said for generating the electric power that drove them. I loved my extended family, the house, the island, and Wheeling, and it hurt to leave. When I was six we spent a year at Ocean View near Norfolk, Virginia, which offered cheaper and more relaxed living than Wheeling. The Depression had slowed down construction until my father only occasionally had a week or two of work to do, and he would go back to Wheeling on those occasions. After the year in Ocean View, my father was employed by the Works Progress Administration (WPA), and was chiefly involved in construction at the Warwood water works. When I was nine, he decided to leave Wheeling permanently and seek work along the east coast. He looked in a number of places and found employment in New York City, where he had connections with people from his childhood in a Catholic orphanage. He was the superintendent of construction for a number of Catholic schools and churches, and that kept him busy until the war came and stopped all such activity. I once had many relatives in Wheeling. My grandfather was one of six children, all immigrants from England, and five of them spent their lives in Wheeling. The family home was sold in 1946. My last close relative there was my mother, who died in 1990. My last connection of all was Susan, a younger second cousin by adoption, who died in 2005 as a result of a collapsing staircase. Even without these connections, Wheeling remains a lovely place to visit and it stirs fond memories. Two of my sons and I have enjoyed returning there annually during nearly every one of the past seven years. This entry was posted in About the1930's and tagged Childhood, Street Cars, Trolleys, West Virginia, Wheeling. Bookmark the permalink. Wheeling NEVER disappoints. I have visited it my entire life and consider it to be MY hometown even though I have never lived there. I feel very fortunate that you came from such a wonderful, rich place and that you have been able to share it with your sons which has also given us a lifetime of pleasure. It does stir up many fond memories but also continues to generate many more with each visit back. What would life be without a dinner at Figaretti’s once a year?